When Sweden-based Starbreeze Studios released Chronicles of Riddick: Escape From Butcher Bay for the Xbox in 2004, gamers were pleasantly surprised. More than just an impressive game in its own right, it was a competent, imaginative companion to an established movie franchise. In fact, it put its poorly-received cinematic tie-in to shame. Three years later, the team behind Escape From Butcher Bay returns with a first-person action title for the Xbox 360 and PlayStation 3, similarly based on an established license. This time their inspiration is drawn not from the big screen but from the pages of Top Cow's comic series The Darkness. And once again, Starbreeze does not disappoint. The Darkness isn't by any means perfect, but it certainly helps cement its creators' reputation. The Darkness' protagonist is Jackie Estacado, the premier young gun for New York's Franchetti crime family. Jackie is part mafia stereotype, part edgy urban hipster. Think Sonny Corleone in a Trent Reznor package. Problem is, Jackie's inadvertently run afoul of his Uncle Paulie, one of the family's most brutal under bosses. Now he's got a price on his head. It's typical mafia fiction, except for one major wrinkle: On his 21st birthday, Jackie becomes host to a sentient, parasitic power called the Darkness. Manifesting itself as a disembodied voice and a tangle of dark, menacing tentacles that sprout from Jackiy's torso, the Darkness' origin is mysterious. It makes its makes its wishes clear, though: It wants Jackie to kill. And given that the city is crawling with his Uncle Paulie's goons, Jackie gets plenty of opportunities to do so. The Darkness proves a useful ally, initially granting Jackie with several novel abilities. In Darkness form, Jackie has a pair of razor-toothed tentacles that curl over his shoulders to share his view. He can transfer his consciousness into one of the tentacles and send it slithering across the ground, over walls and through air ducts to unlock doors and tear off enemies' faces. He can also summon nasty, imp-like creatures called Darklings that will cheerfully kill any nearby humans, then mischievously taunt and abuse their corpses. 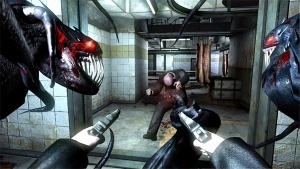 The Darkness further aids Jackie by partially absorbing gunfire and other damage. Jackie's murky new companion gains strength by devouring the corrupt hearts of his enemies, viciously plucking them right from their chests. 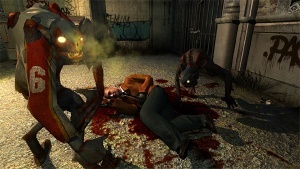 As its feeds, it endows Jackie with new powers, including the ability to summon up to four unique Darkling variants. While equally homicidal, each Darkling excels in a particular area. The Kamikaze, for example, detonates itself near enemies, and the Gunner cuts loose with a huge Gatling gun. Jackie also learns to conjure up a huge tentacle that can impale enemies and lift huge objects. Toward the end of the game, he can even create whirling black holes that will entrap and destroy all nearby humans and objects. There's only one catch: As its name implies, the Darkness only has power in dimly lit areas. If Jackie ventures into the light, the Darkness will retreat into his body, leaving him underpowered and vulnerable. As a result, Jackie spends a lot of time destroying light sources and fighting in the shadows. The Darkness feels like a stealth game at times, but make no mistake: Jackie's no Sam Fisher. He doesn't hide in the dark. He revels in it.